Salt was gathered on the surface here as far back as the 10th century AD. Then as it became more difficult to get and more popular the people started digging it out of the ground. Eventually they reached over 140 m (over 400 ft.) underground and 27 kilometers (17 miles) of tunnels and chambers. This is our guide of our English-speaking tour. The logs are a very small part of the thousands used to keep the hundreds of feet of earth off the heads of the miners. As they followed the best salt they built cribbing and support posts. 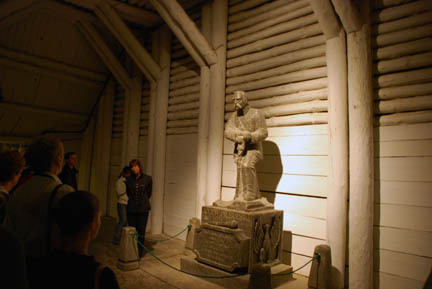 The floor and the statue to the right are made of salt. All but thin streaks of the salt were this dark grey color. There were horses used to raise and lower barrels from the deeper parts of the mine. The rope, which is as thick as my arm, goes from the windlass over and down the shaft on the right and is continuous. The loads are raised by having the horses walk counter-clockwise and then lowered by turning them around and having them go clockwise. They lived their entire lives down here. There were several of these life-size dioramas showing how it was during most of the mines existence. One of the more spectacular stops was at St. Kinga's Chapel. 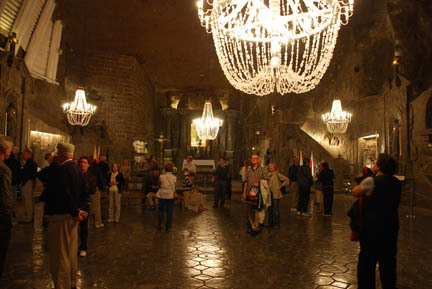 This huge room is carved out of the salt, including the statues and bas reliefs. This relief is about a foot deep, front to back, and 4 by 6 feet in size. 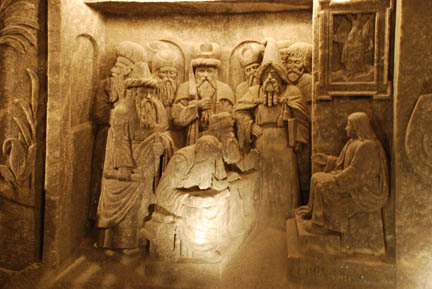 On the right, seated, is Christ talking to the people. Kathy is admiring one of the chandeliers. They are made of white salt crystals and wooden support pieces. As you can see there are several of them in the room. In this room. 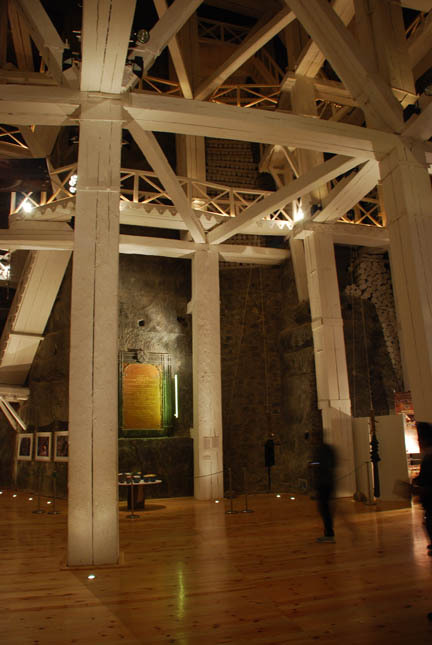 no bigger than the chapel, there were these huge support beams and posts. The posts are made of four 12"x12" beams banded together. 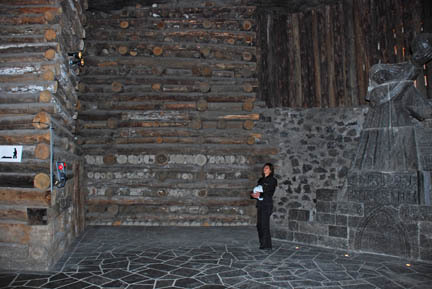 The amount of wood, much of it massive, in the mine was amazing There had to be millions of board-feet of timber there. It must have been a huge job getting it into the mine and into position using only horse and man power. There were lots of life-size statues scattered through the mine. Many were famous kings, queens, poets and others as well as several dioramas of miners, all carved out of salt. Lastly we were left off at the bar/cafe/souvenir area. We ate lunch here. 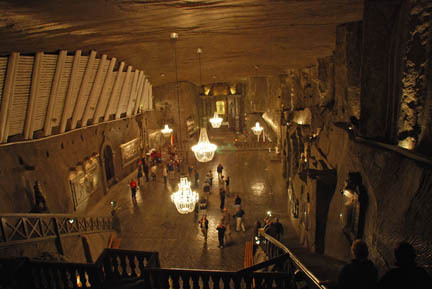 The prices weren't too bad considering the location, 400+ feet deep in a salt mine. 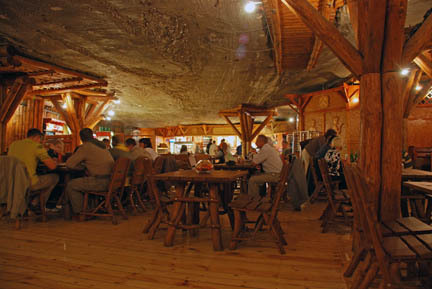 The ceiling is salt as were the walls not covered with wooden decorations. The posts here are decorative and are not holding the ceiling up. Then we took the elevator to the surface. 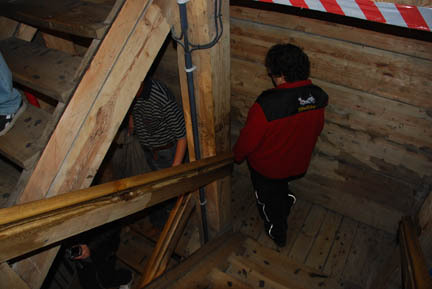 It was the original lift used by the miners with two tiny cages, one over the other, that they crowded us into like sardines! That afternoon we had time left over so we went into the main square in Krakow. We had expected the usual picturesque buildings, and got them. But we also got a craft fair and folk exhibition. 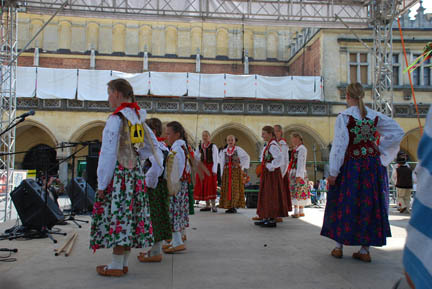 There were several dozen booths of a wide variety of crafts and a stage with dancing and music. It was very interesting and a surprise as this was a Wednesday afternoon. These events are usually on a weekend. 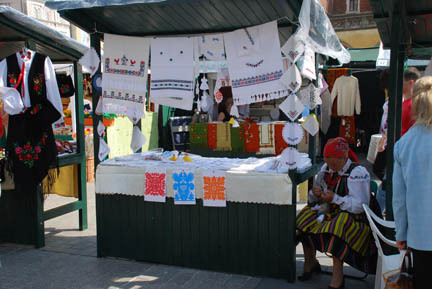 This lady was making beautiful hand-stitched table linens. They were gorgeous. From here we are turning south, straight back through the Slovak Republic and into Hungary. A one day run, three countries, but first we had to get out of town. This didn't prove to be simple. 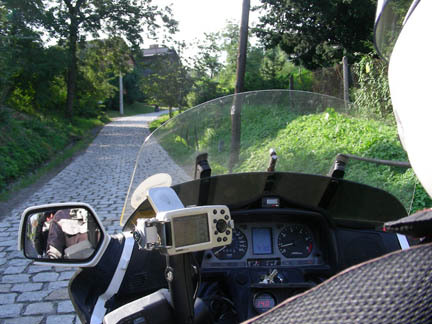 Because of the way speed limits are set in the EU the GPS cannot always find the easy way to somewhere. This time it found this narrow, steep, cobbled lane! 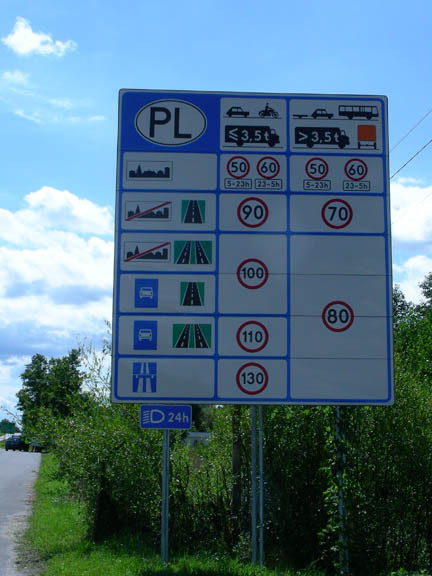 This means the GPS has rated all city roads at the same speed, and all country roads at their speed, etc. It does not matter that it is impossible to travel at that speed on a particular road. So the GPS picks the shortest route, not necessarily the main travel route, to the programmed destination. I learned this long ago but can't always see up the road before following its instruction to turn the corner. It sure has led us on some very interesting roads through some beautiful countryside in several countries. But is not desired when trying to make distance on a long day in the saddle.